Celebrate during any season with this resource:Stewardship of Creation: A Thirty Day Discipline. Download and copy this daily devotional booklet. Each day has a scripture verse, theological reflection, fact about the environment, action we can take to address it, and a prayer. Make this available to each member of your congregation as a discipline during any season of the year. From Mustard Seed Associates with a focus on simplicity and attending to our surroundings, you can find links to seasonal Bible readings. Here is for Advent 2014. They also offer A Journey Toward Home: Soul Travel from Advent to Lent, with reflections from O Antiphons through Epiphany with themes of "Gather, Feast, Create." The PC-USA's Environmental Ministries annually creates a daily Advent calendar with a focus on caring for God's creation. The 2014 edition used the hymn "It Came Upon a Midnight Clear" click here to access it. 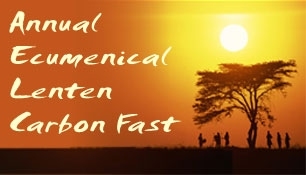 The United Church of Christ in Massachusetts sponsors an annual ecumenical carbon fast for Lent. Receive daily e-mail with message and a action to reduce carbon output for yourself and your congregation. Click here to read the invitation on their page. The Grace of Forests A Lenten study packet from Australian Roman Catholics on encountering forests with practices of "God Revealing, God Inspiring, God Challenging." Click here for the pdf. Tread Lightly for Lent: Environmental Ministries of the Presbyterian Church (USA) offers a calendar each year for Lent with a focus on sustainability and stewardship. Download yours to focus on your relationship to Creation this Lenten season. Creation Justice Ministries offers an annual Earth Day reflection resource. Past themes have included animals, water, and sustainable food amid climate change. The downloadable packets typically include prayers, teaching ideas, and small group discussion topics. Find more, including current listings on our Earth Day page.